In live news, the band are now playing Heavenly, a hit for Showaddywaddy in 1975, in their live show. On 8th November 1974, Showaddywaddy released their eponymous debut album, featuring 12 tracks, nine of which were original material written by the band. The opening track was Hey Rock And Roll, a number 2 hit from earlier in the year, followed by Bony Moronie, a track that the band played on their appearances on New Faces the year before. Other tracks featured included Johnny Remember Me, which is still in the band’s set today, as well as another hit single from the Summer of ’74, Rock ’n’ Roll Lady. All in all this was a debut album to be proud of, and which the public bought in great numbers with the LP achieving the top-10 in the album charts, reaching the number 9 spot and remaining on the chart for nearly 5 months. On 1st October 2014, I caught up with Trevor Oakes to find out how he is doing now, and a bit about his time in Showaddywaddy. Click here to see the exclusive interview! Dave Bartram made a winning return to our screens on Sat 23rd August with an appearance on a celebrity edition of the BBC game show ’Pointless’. 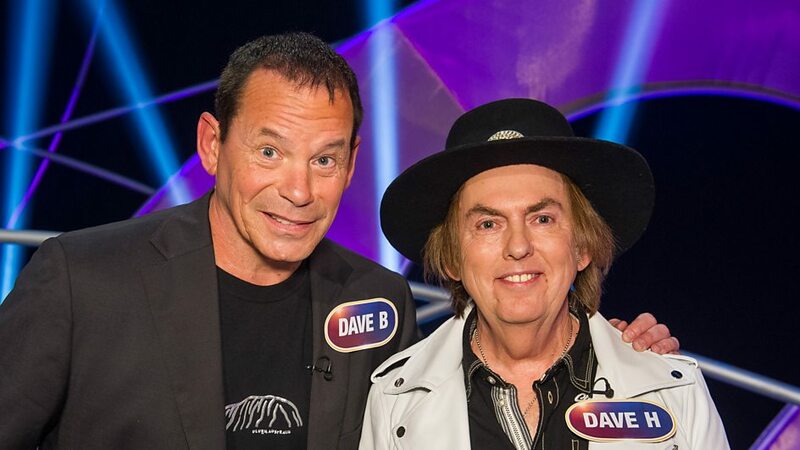 Dave teamed up with Dave Hill from Slade, and the two Daves were triumphant, beating Toyah Wilcox and Mark King (Level 42) on the way. The show was recorded on Monday 17th March 2014. Dave Bartram’s 2nd book is now due for release in September 2014. Dave Bartram attended Southwark Crown Court today to give evidence in the Dave Lee Travis trial. It was alleged that a SWW fan was a victim of DLT at one of the band’s gigs in Gloucestershire in June 1978. It was reported that Dave Bartram stated in court that, “I remember the gig because Dave (DLT) got up onto the stage, got on a drum kit and proceeded to make a bit of a racket”. On Thursday 13th February 2014, Dave Lee Travis was found by the jury to be not guilty of ten of the twelve charges he faced.